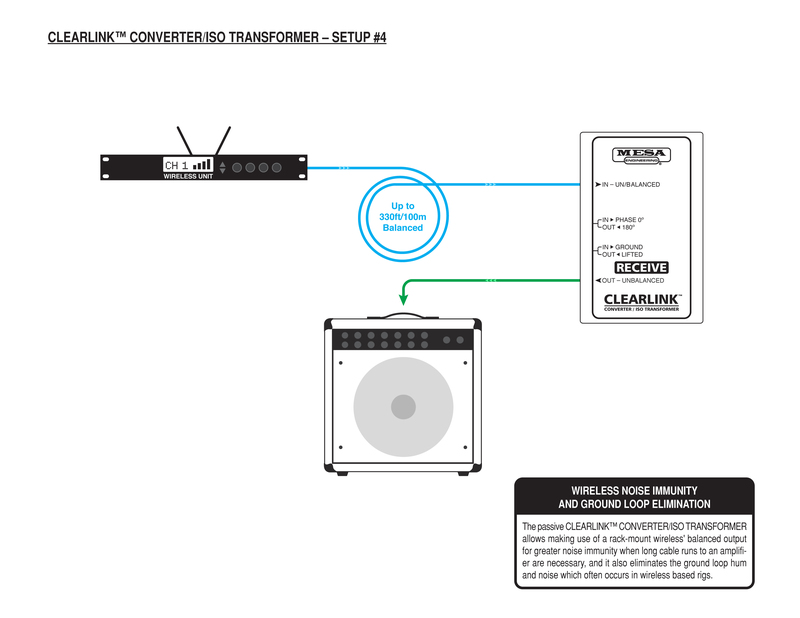 The CLEARLINK RECEIVE ISO/CONVERTER is the ultimate big stage solution for all instruments where signal must travel longer than 15 to 20 feet. It’s most common application is receiving a buffered signal through long cabling from its companion product–the CLEARLINK SEND–at the tail end of a Pedal Board and converting the XLR balanced signal that transmits back to a ¼” unbalanced signal appropriately matched for feeding an instrument amplifier. It can also be used to combat “Ground Loops” or for any isolation job where shared grounds create noise problems, such as a multi-amp switching setup, as well as any balanced XLR to ¼” unbalanced conversion. Along with Stage applications, the CLEARLINK RECEIVE is also well suited for the Studio, enabling a very long cable run from the Control Room to the Cutting Room, where an amplifier might be mic’d. This CLEARLINK features a Studio Quality Buffer circuit and Isolation Transformer, Ground Lift as well as Phase Flip switches rounding out its feature set for either of the previously mentioned scenarios. With the ability to isolate and convert from most pro signal sources, it’s a must-have for the gigging musician or Stage Tech. For the ultimate Tone protection in a Guitar rig, use a STOWAWAY™ before the Pedal Board, the CLEARLINK™ SEND at the end of it, and a CLEARLINK RECEIVE at your amplifier for the conversion and total reclamation of Tone. See FULL DETAILS for Specifications and FAQs. Setup Diagrams & Instructions Below. ¼” Unbalanced Output is electrically isolated from the input, via the specially designed and shielded isolation transformer. Phase Switch - Inverts (reverses) the phase of the output signal in relation to the input signal. Ground Switch - Safely lifts (isolates) the ground connection between the IN and OUT jacks, eliminating ground loop hum and noise. NOTE: Due to efforts for continual improvement, all specifications are subject to change without notice. Can I use the CLEARLINK™ RECEIVE as a DI-box? Sorry, but it’s not a direct-box. Can I use the CLEARLINK™ RECEIVE for re-amping? Sorry, but it’s not a re-amp device. What is “galvanic isolation” and does the CLEARLINK ™ RECEIVE have it? Galvanic isolation is another term used to describe two circuits that are electrically and physically separated from one another, in order to prevent a ground loop from occurring, which results in hum and noise. All audio isolation transformers have/provide it; some manufacturers choose to use the term and others don’t, and just go with “isolated” or “isolation”. It’s all the same, so yes, the CLEARLINK™ RECEIVE has “galvanic isolation”, and it is provided by a specially designed and shielded audio isolation transformer. 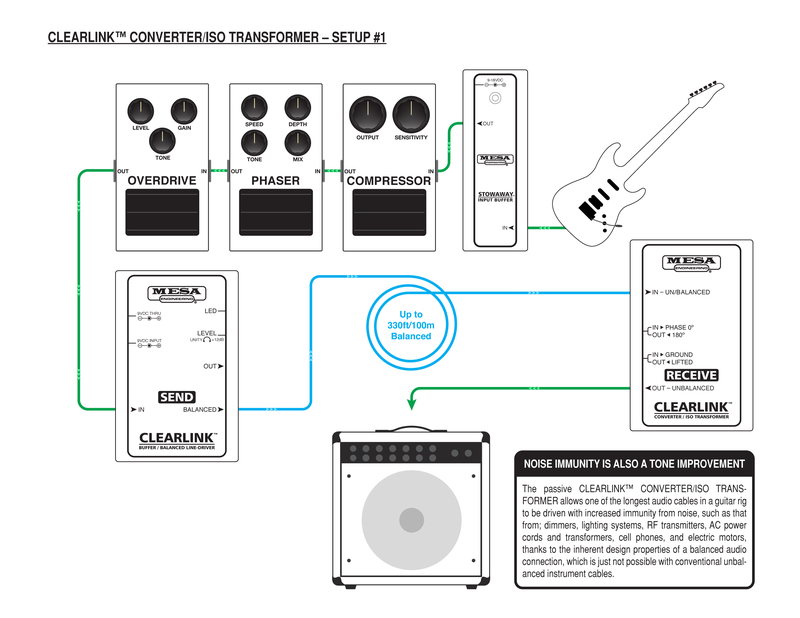 Can I connect pedals between the CLEARLINK™ RECEIVE and the input of my amplifier? You sure can, just remember to use a high quality shielded 1/4” TS instrument cable that is 5ft/1.5m long or less, between the CLEARLINK™ RECEIVE and the first pedal, in order to minimize high frequency roll-off. Can I use the CLEARLINK™ RECEIVE without a CLEARLINK™ SEND to break a ground loop that is causing buzz, hum and noise? Yes, the CLEARLINK™ RECEIVE can be used with unbalanced guitar signals from a wide variety of pedals and other buffered devices, to safely eliminate ground loop hum and noise, and to correct phase reverse issues, making it a must-have tool for every guitar player and technician. Just remember to use a high quality shielded 1/4” TS instrument cable that is 5ft/1.5m long or less, between the CLEARLINK™ RECEIVE and the input of your amplifier, in order to minimize high-frequency roll-off. I am running multiple amplifiers, each with a CLEARLINK ™ RECEIVE, but my tone (still) sounds weird, why is that? Running multiple amplifiers at once can sometimes lead to a phase cancellation problem, which results in a sound that can be described as hollow, thin, not as loud, lacking low end or fullness... The best way to test and fix this is to try and set the amplifiers to the same volume level, individually. 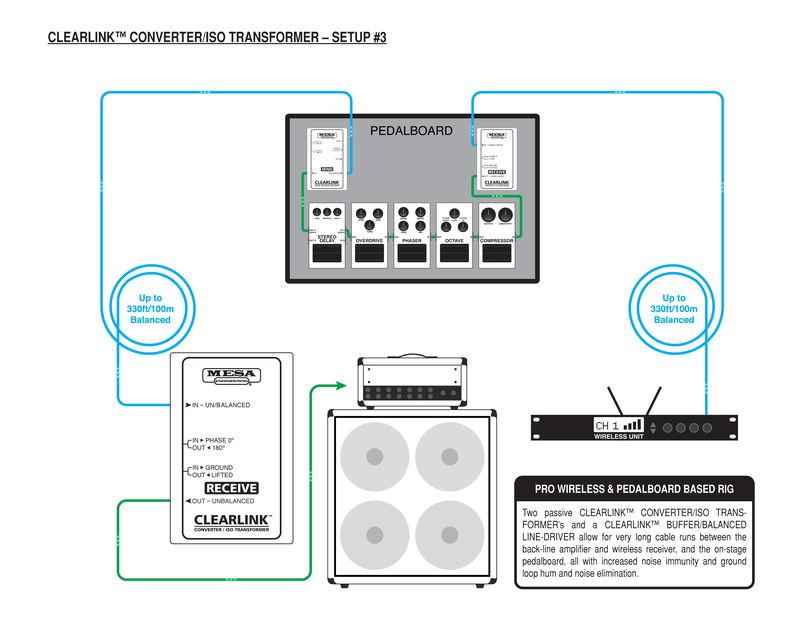 Then activate the amplifiers simultaneously and listen with the PHASE switch of each CLEARLINK™ RECEIVE in both positions, all possible combinations - the best, correct settings will result in a sound that can be described as fuller or slightly louder. I am running multiple amplifiers, each with a CLEARLINK ™ RECEIVE, but (one or) some of them (still) have a buzz/hum, how can I get rid of it? First, make sure that all the amplifiers are properly grounded with a 3-prong AC power-cord plug! Older amplifiers with 2-prong AC power-cord plugs should be checked for proper grounding, and if necessary, serviced before using them in a guitar rig. Defeating an amplifier’s safety ground may not only be ILLEGAL, but it may also pose a SHOCK or ELECTROCUTION HAZARD. That said, and as you’re probably already aware, the most common cause of buzz, hum, and noise when connecting multiple amplifiers in the same rig, is a ground loop. The isolation transformer inside the CLEARLINK™ RECEIVE and its GROUND switch, work together to safely eliminate a ground loop. 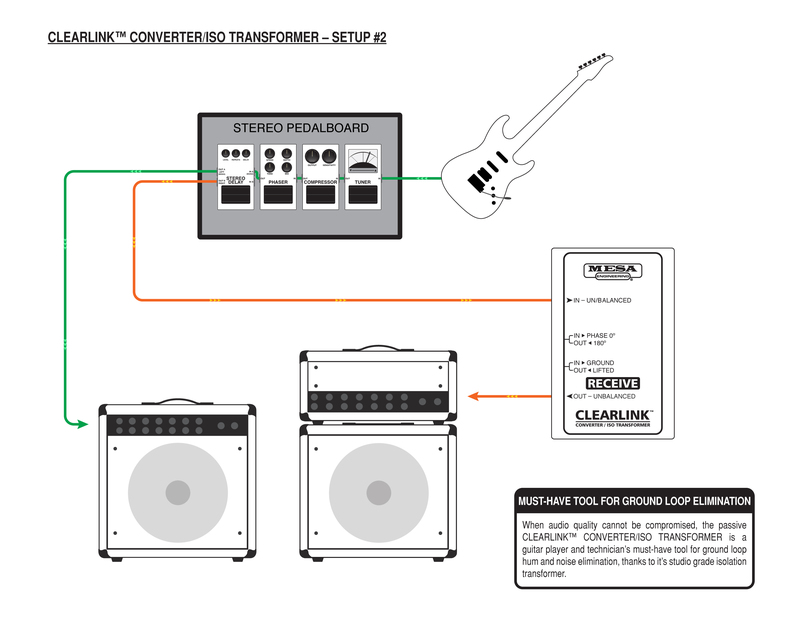 With a CLEARLINK™ RECEIVE connected to the input of every amplifier in the rig, the GROUND switch on ONLY one CLEARLINK ™ RECEIVE should be set to the “IN” position, so it can “pass” its earth ground reference to any pedals, and the guitar. The GROUND switch on ALL the remaining CLEARLINK™ RECEIVE’s should be set to the “OUT” position, to eliminate the ground loops that would otherwise form. Try setting each GROUND switch to the “IN” position, individually, and use the combination which results in the least amount of buzz, hum and noise. Second, remember that any device which contains an audio isolation transformer is susceptible to hum from the magnetic field generated by a power transformer, such as those found in an amplifier, effect processor, “wall-wart” power adapter or universal pedalboard power supply. Even with adequate shielding of the audio transformer and the device itself, there can still be a potential for unexpected hum. So if an unusual hum does occur, which cannot be eliminated by either position of a GROUND switch, try re-locating the CLEARLINK™ RECEIVE. Typically it would only require being moved a short distance in a particular direction to resolve this type of hum.